Stella Nova is really fun to play. The game has been play-tested across the country – on the West Coast, on the East Coast, and in the Mid-West. Bottom line: Kids loved it! There is adventure in riding camels and capturing wild stallions. There is intrigue in assassins and spies and secret codes. There is excitement in being the first to reach the baby Jesus! The game is a fun challenge for adults, too. It is not just a Racing game. It’s a Strategy game, where players need to determine the most efficient path and what resources to keep. 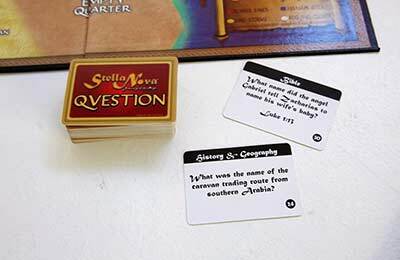 And it’s a Trivia-Question game for parties where “brainiacs” can demonstrate their knowledge of Bible history and geography. Stella Nova has something for all three types of players. Stella Nova is a beautiful and top quality game, as you can see from the Game Pictures. The box-top art captivates the imagination with the three wise men riding high on their camels. One play-tester said her sons brought the neighbor kids over just to look at the box top! The huge 20 x 30-inch game board map has beautiful colors of blue and aquamarine seas and green fertile river valleys. The map is an accurate depiction of the middle East at the time of Christ, even down to the ancient names of the cities. All parts of the game are in full color: the box, the game board, the playing cards, the question cards, even the player tokens– none are black-and-white or monotone. And the game is made to last with above-standard quality materials. For example, the box is at 60pt, which is 50% thicker than the standard 40pt. The playing cards are 12pt rather than 10pt. All the pieces have a glossy coating, even the cards, so that they are not so easily smudged and dog-eared with play. The magi on the box top are wearing golden yellow robes. This is a status symbol that only the wealthy could afford. The color comes from dying the robes in saffron, which is an expensive spice even today. The ancient gold mines were located in Kush. In the Middle Ages this region was called Nubia, but today it is called Sudan. 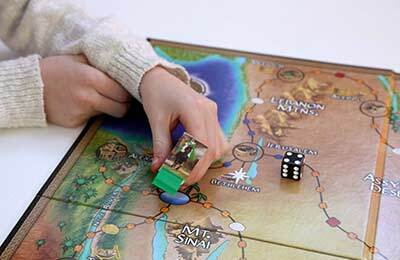 The city of Nineveh in Mesopotamia was an inconsequential town at the time of Christ, so it is not on the game board map. However, Babylon was still an important city, and is shown on the game board between the Tigris and Euphrates Rivers. The two great centers of learning, Alexandria and Antioch, are also on the map. They along with Rome comprised the three largest cities in the Roman Empire. Answers to biblical questions have citations by chapter and verse. The answers have been checked and conform with the venerable King James version (KJV), the New Living Translation (NLT), the New Revised Standard version (NRSV), and the New American Bible (NAB). 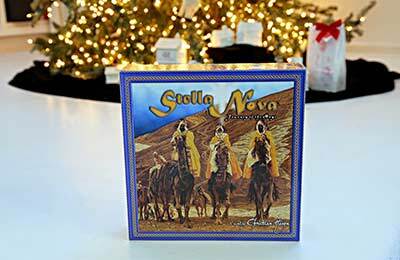 Stella Nova is made in the USA to support our fellow countrymen and stimulate our economy here at home, even though it cost us more to make it here. We are proud to put the American flag on our game box.